There is a part of every person that wishes to travel from one place to another. Some call it wanderlust, some call it the need for exploration. Regardless of the reason why a person wishes to travel, the results are the same. There will be a subconscious need to record and share their experiences during the journey with other persons, be it in the form of chatting (in person and online) or online interactions such as social media posting. There are also times where one of these individuals will instead like to create a website to post their adventures while making it a life goal to continue their travels. 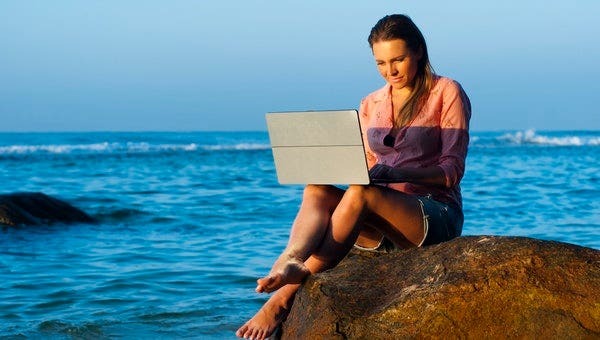 This has led to the increase in popularity of travel blogs. As you will be reading through this article, we will be showcasing the top WordPress themes that will be a great template to use for the creation of your own travel WP blog. SiliconBlogger is a WordPress blog theme that is simple, lightweight, and user-friendly for both web designers and site visitors. This professional WordPress theme is made in such a way that it will allow even newbies or inexperienced web designers to create an amazing and professional-looking website. It is capable of supporting the creation of several website formats such as web magazines, review sites, blog sites, and many more website. This website template even consists of several post formats and layout designs that will allow you to optimize the use of each individual page of your website. This can lead to the reduction of the overall size of your website, which will directly affect the resource requirements for running and maintaining the site. 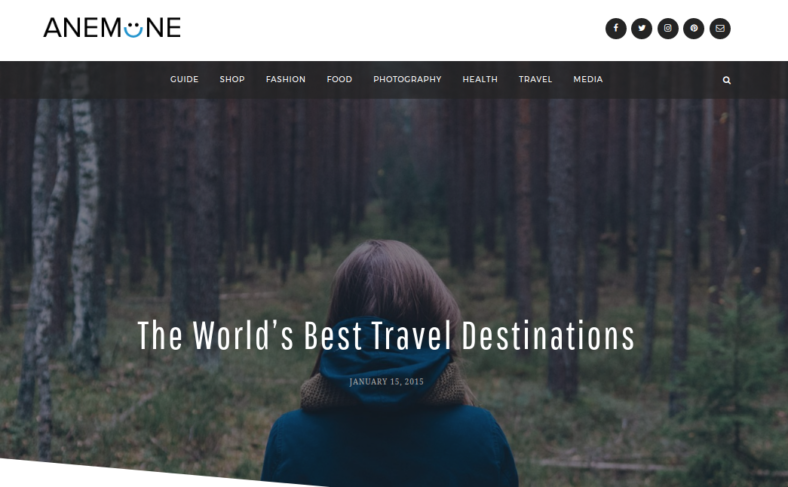 This magazine WordPress theme is known as Anemone and it is designed to mimic the appearance and feel of traveling around, which makes it a perfect choice for the creation of a travel blogging. It’s capable of supporting the uploading and posting of several forms of contents such as audio files without affecting the overall performance or speed of the website. In addition to its perfect design, it is also made to have a fully responsive layout allowing it to be viewed and accessed from several forms of gadgets and devices aside from desktops. At first glance, you can easily determine that this website theme is capable of being one of the best HTML blog themes with its multiple layout designs integrated into each page. This allows you to better display your content and make your website appear more lively. This website template is completely responsive in terms of design. This allows the site to be accessible on every device available, further increasing the range of its possible audience. It also consists of many useful and fully functional features and add-ons that will make your site even more impressive in terms of appearance and function. As we all know, the creation of a blog is directly dependent on the preferences of the site manager or site creator. 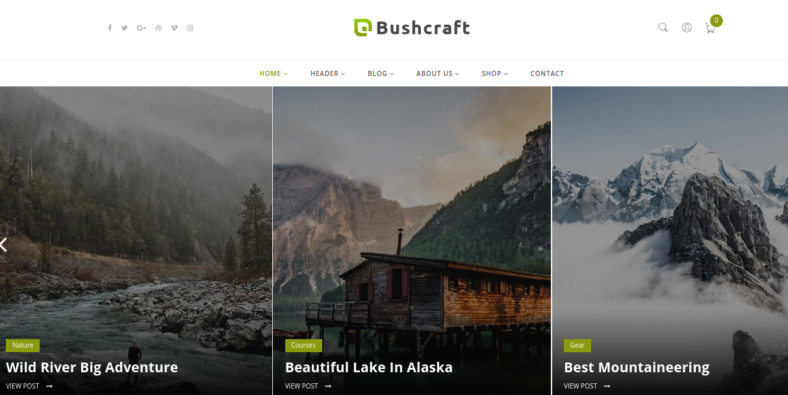 But in the event that you wish to create a travel blog, then you can consider using Bushcraft mainly because of how well it looks and functions. This personal blog WordPress theme even contains functions and features that will allow for the creation of an online store as well as the ability to upload several forms of content to make your website more diverse and interactive. Experience an unforgettable romance in the City of Love. This Paris-themed template showcases the world-famous Eiffel Tower. So if you’re planning a Paris vacation soon and you’d like to memorialize your stay through an online site, then this template is the best choice for you. Go for the refreshing mint color of this WordPress theme if you’re the kind of traveler who likes to take things easy while exploring a new city. The clean, modern vibe of this template is perfect for urban explorers who enjoy discovering new sights off the beaten track. Enjoy the hipster vibe of this clutter-free WordPress travel theme. Its bright, cheerful colors are perfect for bloggers who wish to showcase the stories and pictures of their personal travels. You can’t go wrong when you choose this simple, dark-colored WordPress theme. Its simplicity allows you to highlight your content so visitors will only focus on your most recent posts. The easy navigation also helps visitors to quickly find other content. Showcasing your stunning holiday snapshots can be very effective when set against white space, and this theme has white space to spare. Your site visitors will surely appreciate the uncluttered view of your posts as they are arranged neatly on your homepage. Organize your travel-related posts easily with this WordPress theme. The dark background color allows you to display your striking nature or landscape photographs more effectively. It supports nine post formats and lets you choose from nine different layouts. This responsive WordPress blog theme features a grid-based design and a front-end style customizer. It looks great on any device you view it from, so bloggers can be sure that their content will always be displayed properly. Get this modern, elegant-looking template today if you want to make your travel blog really stand out. 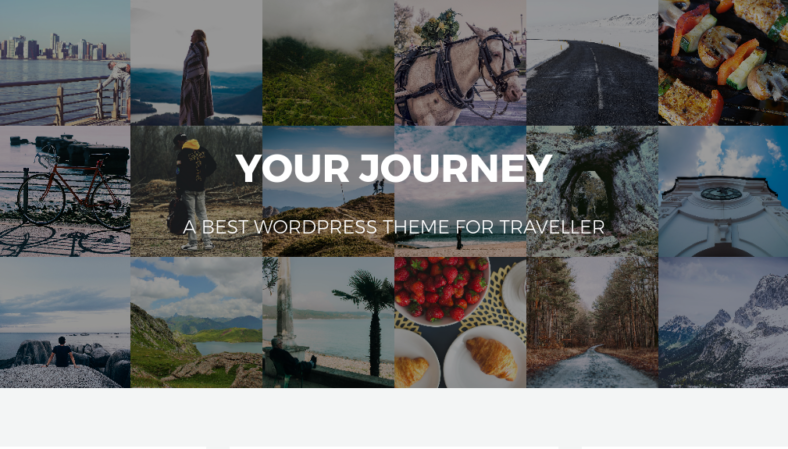 Your Journey is WordPress template with a responsive layout and 30 different layouts for you to choose from. You can opt for a classic grid rotator, a standard masonry left sidebar look, a map layout, and many more. It’s a versatile theme for bloggers who want to keep their site looking fresh with every new post. Sightsee is a clean, minimal WordPress template built on the Bootstrap platform. It is fully responsive, making it viewable on various screen sizes. It features a live customizer that lets you change the look of the website and view the results in real time. 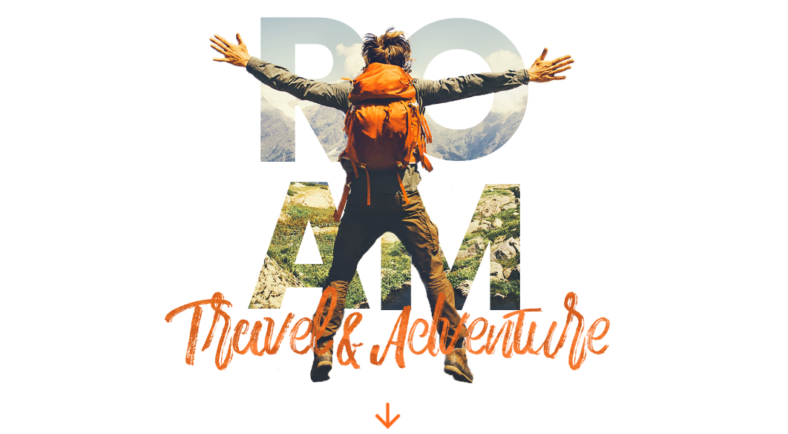 It’s the perfect theme for travelers, bloggers, and photographers. 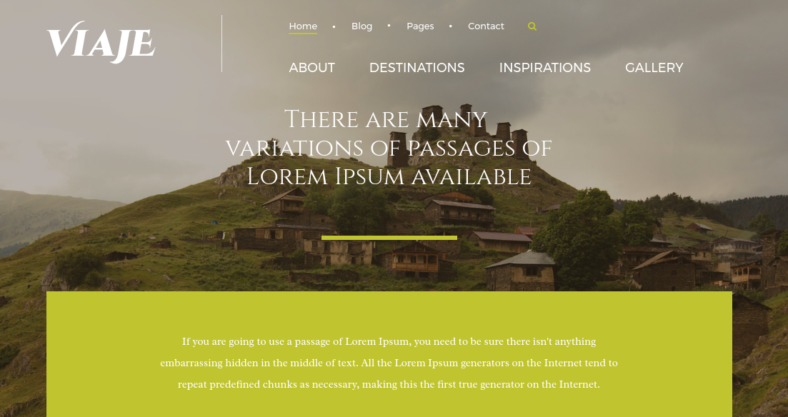 Viaje is a classic-looking responsive and retina-ready template. It’s designed specifically to meet the needs of travel bloggers who are keen on showcasing photographs. Customize its typography example so you can truly make it your own site as you treat your visitors to eye-popping landscape photography. 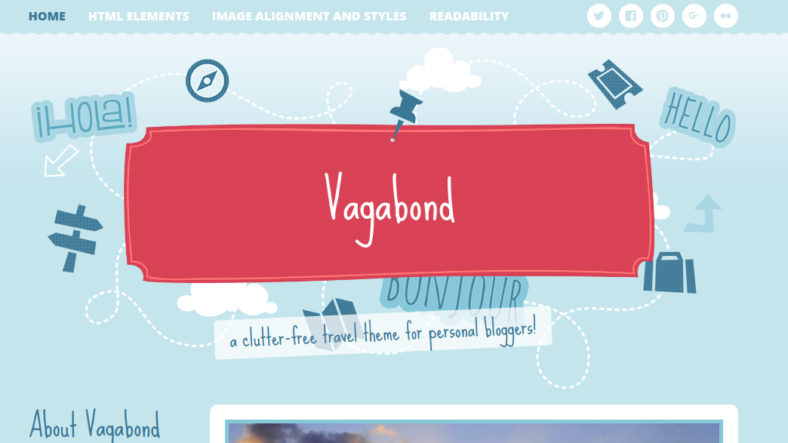 This theme has been developed especially for travel bloggers. It has nine post formats including standard, link, quote, gallery, video, and image. It also makes it easy for you to choose your favorite out of nine available layouts for blog posts and archive pages. 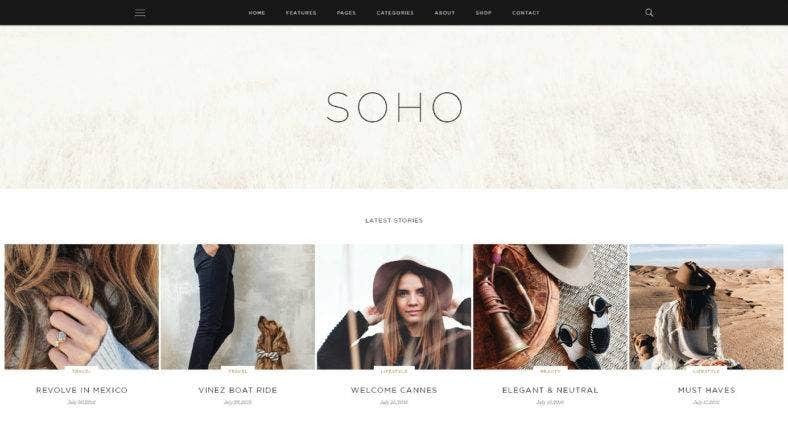 Choose Soho if you would like a blog template that is minimal yet chic. 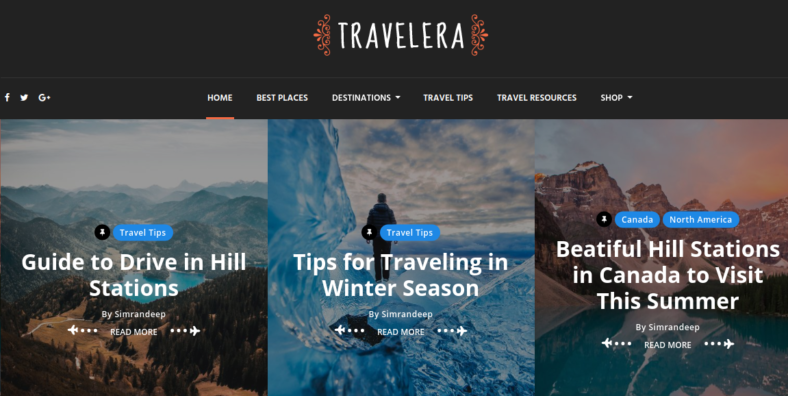 This theme is great for travel bloggers who wish to display their photos in an uncluttered, elegant layout that easily catches the eyes of visitors. With this theme, each blog post can be a fashion statement. 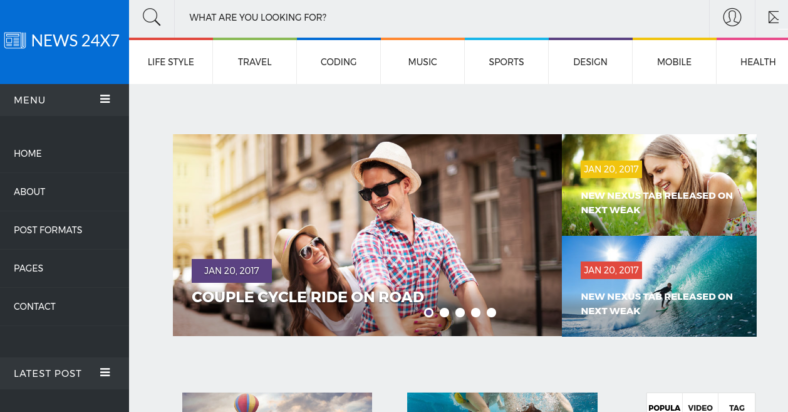 Bloggo is the ideal theme for those who wish to create their own travel blog. It has over 20 layouts and designs with 10 category-specific layouts for various posts. With five custom widgets, no paid plugins, and social media integration, it can perfectly showcase your travel photos and blog posts. This dynamic-looking WordPress theme is fully responsive and SEO-friendly. The Slider Revolution and Visual Composer plugins are included for free and users can easily manage the site through an easy-to-use admin panel. With all these great features, it’s a great choice for inexperienced site managers who wish to establish their own website. Below are a few other templates that you can use for your travel blog. Each one is guaranteed to look good as well as function capably so your readers will enjoy every visit to your site. Check out each one showcased here and take your pick of your favorite.